These are not affiliate links! 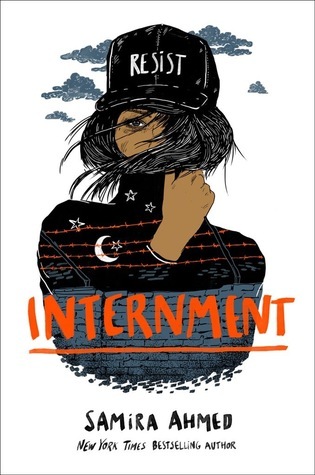 I read and admired The Hate U Give back when I read it, so I couldn’t pass up on reading Internment when I heard about it. As with THUG, there are definitely some very important topics. Another fact is that this is so far from what I know that it hit me quite hard while reading so.. Let’s dive into this review. Some say it makes people sound ignorant when they admit not knowing much about how things are going in other countries and continents. I’d say it’s fairly normal in a way, since every part of the world, every community has its own struggles. We can only try and educate ourselves more on the things we don’t know all that much about. This, and my experience with THUG is what I kept in mind when I started reading Internment. Courage isn’t the absence of fear. It’s doing the right thing in spite of it. I knew it was going to hit home – not only because I was a hormonal mess at the time of reading, but also because it confronted me with so many little things I didn’t understand or don’t struggle with myself. This is exactly why this book deserves to be heard, deserves to get a louder voice. We might not have weapons, but we have our voices. Let’s get loud. Personally, I’m more “familiar” with racism based on skin color than anything else. Internment reminded me that there are more ways to be racist, and the one handled here is based on belief. Everything our characters go through felt so real to me – I honestly teared up at times. This book more than showed me our world needs work, and a lot of it too. Sure, it’s set in the future, but we all know racism is present everywhere and probably isn’t going anywhere any time soon – unfortunately. They stay quiet, using their silence and privilege as a shield to protect themselves. Since this book handles racism based on belief – specifically internment camps for Muslims – pretty much all our characters are diverse. Most of them are Muslim, with different skin colors, but there’s also one Jewish, black side character. Seeing how this last one was privileged over the Muslim characters was both real and confronting in a way I didn’t expect. It added an extra layer to this story for sure. The last, but more minor thing, I was ridiculously happy with when it came to Internment, is how Layla already is in a relationship when the story starts. At first I feared this would mean the focus on romance would be a bit too present for my liking, but that wasn’t the case. It’s there, but the main topic of this book is definitely the struggle with and fight against oppression and racism. I also really liked how fierce and true Layla felt all the time. At times it did feel like a bit too much, but overall she’s such a strong and admirable woman. You can only hope we’d all be the same should we ever find ourselves in the position she was in. The world has shattered, and all that’s left is this alternate universe full of broken people with nothing to hold on to. Like I said, sometimes Layla’s characteristics felt like a bit too much, but that had more to do with the influence it had on the relationships in this book. Because the focus was very much on Layla’s fight to break free, I missed seeing more depth when it came to her relationships and friendships. That could solely be me and my expectation that one would need those relationships more in order to survive in an environment like an internment camp though. I can’t say anything less than give this book a chance, read it and let it leave its mark on you like it did on me. We’re all human and we shouldn’t be judged based on anything other than our own actions. I’ll remember this book for a while to come, so I hope at least some of you will decide to pick this up. What are some books that left a mark on you? Next ›WINTER ~ Wrapping up my seasonal TBR, goals and bucket list! There are so many books that left their mark, one of them being The Hate U Give. I’d say Internment is definitely a book you might want to check out as well then! I’m not a fan of dystopian. It’s categorized as dystopian, but I honestly felt like it didn’t really have that feel to it all that much apart from some minor aspects like a stamp being permanent on their wrist but not visible to the eye and things like that. It felt very, very realistic to me – but of course that’s thanks to the subject of the book as well. Ahhh, that’s good to know that it reads more contemporary than dystopian.